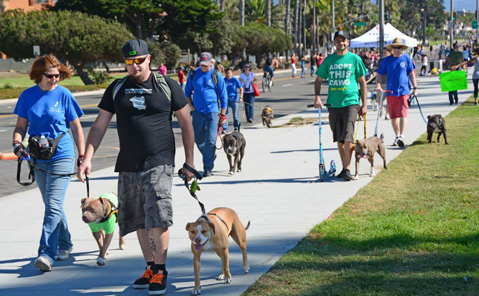 On Saturday, October 25, Shadow’s Fund held its annual Pit Bulls on Parade stroll along East Beach in an effort to educate folks about the American pit bull. With tongues lolling and tails wagging, pits and American Staffordshire terriers pad their way down the sidewalk greeting tourists and locals alike. “The little staffie Apple (pictured in tutu) was the star of the show that day — flirting with firefighters and wiggling for everyone that she met,” said Shadow’s Fund’s Jill Anderson. Apple is adoptable from the Santa Barbara county shelter in Goleta (5473 Overpass Rd., 681-5285). For more information about the pit bull parade and Shadow’s Fund, visit shadowsfund.org.